Have Your Eyes on a Papillon? Does the Papillon pronounced (pappy-yawn) look like a butterfly to you? It must have resembled one of these lovely insects early in history because that is how the breed got its name although they were called by other names earlier in their history. The breed's name means butterfly in French and gets the name due to their distinctive erect ears. The first thing that most people notice about this breed are the ears that stand erect and are set high up on the head. Hair grows and drapes over the ears in long fringes creating the appearance of butterfly wings. These dainty, friendly dogs are alert, highly intelligent and very trainable making them an ideal choice for families, singles, and couples. As adaptability goes, they thrive in the city, the suburbs and country, basically anywhere but they have become very popular in cities as the ideal condo or apartment dweller. Being highly intelligent, they can be easy to train and do well in many kinds of dog activities: obedience, agility, tracking and herding. They also make excellent therapy dogs. They have even been known to catch a mouse or two. They thrive on any type of human stimulation and will do whatever it takes to please their people. If you’re looking for a dog that never outgrows their puppy years, keeping you active and entertained for their entire life span, this may be the perfect breed for you. They may look elegant, but don’t let that regal appearance fool you. They were never meant to sit and look pretty—rather they were meant to play and keep you company. As lap dogs go, some will fill this spot exceptionally well, but not all. Males have been known to be better lap dogs than the females, but this is not necessary a hard and fast rule. They do well around children who have been taught to respect their tiny size, other dogs, especially other small breed dogs, and Yes, even Cats! The American Kennel Club breed standard describes the Papillon is "a small, friendly, elegant toy dog of fine-boned structure; light dainty and of lively action; distinguished from other breeds by its beautiful butterfly-like ears." 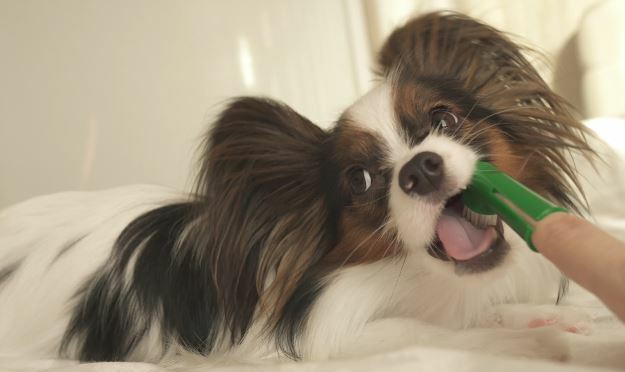 The history of the Papillon dates back to around the 14th century where it originally descended from toy spaniels living in Europe. While the exact origin of the breed is debated, most accounts suggest that it originated in France but was developed in other countries including Spain, Italy and Belgium. Companion dogs were rarely seen before the Renaissance but during this time, they became very popular the upper classes and nobility. Wealthy people were the only ones that could afford to keep a dog who did not have a specific job to do such as herd or hunt. King Louis XIV is probably the most famous owner of the dwarf spaniel. Some famous ladies including Madame Pompadour and Marie Antoinette of France and Queen Sophia Dorothea of Germany were supposedly owners of the Papillon. The name Papillon is a rather recent invention as these dogs have been called Epagneuls Nains, Dwarf or Continental Spaniels, Little Squirrel Dogs or Belgian Toy Spaniels. The breed was shown in many paintings of the Renaissance period; much of the breed's development has been determined by studying these paintings. Do the Ears Resemble a Butterfly to You? The distinct ear carriage that we think about today did not occur until more recently. The cause of the change remains up for debate, but often cited as a mutation. Before then, most of these dogs had a drop ear appearance. This drop-ear dog is still around today and called Phalene, meaning night moth. 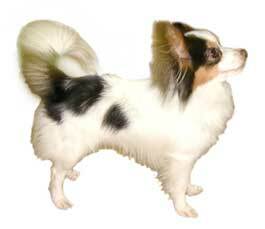 In some countries today, the Papillon and the Phalene are considered to be two distinct breeds. This is not the case in the United States or in the U.K. where both are considered to be different varieties of the same breed. Today, it is not unheard of to have both Papillon and Phalene born into the same liter. The colors of the breed have changed too over history. Early dogs were predominately solid colored whereas today most are white with colored markings. While highly popular in many European countries, the breed was less popular in the U.K. and the U.S. They were introduced to Britain in 1905 and later in the U.S. The first breed club in the United States was not formed until 1935. The popularity of the Papillon breed grew very slowly, making it still a relatively rare breed It has slowly gained popularity over the last 20 years, now ranking number 37 with the AKC. 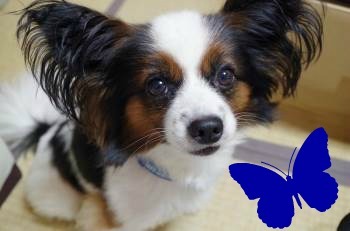 Papillons have been bred for centuries to be excellent companion dogs and they are true to their purpose. They love people and prefer to be close to their special people throughout the day and night. While some separation is expected and necessary, the Papillon would choose to be by your side 24/7. This, along with the Pap's dainty appearance, diminutive size, and great trainability, probably accounts for their reputation as an ideal city dog. But they do equally well in any type of setting. Most Paps are friendly, outgoing and happy preferring people to anything else and they are never reserved when it comes to offering "kisses". 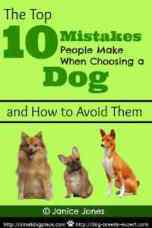 With their outgoing personality one might assume they are high strung or nervous as other small breeds but this is not the case. These little butterflies can be trained to do many different things and it is recommended that puppies be enrolled in puppy kindergarten classes as early as possible. Keeping their minds and bodies activity is the key to a healthy happy pet dog. As with other small breed dogs, house training can take longer to accomplish. Some Papillons have been known to bark, so a few early lessons will help in this area. They are an energetic breed so if you are looking for a fellow couch potato, this is likely not the breed for you. But if you enjoy canine companionship and relish the idea of getting involved with dog activities, this might be a perfect match. They thrive on mental as well as physical stimulation and if this is not provided, they will find ways to entertain themselves. Unfortunately, their idea of fun may not always agree with their owner’s. 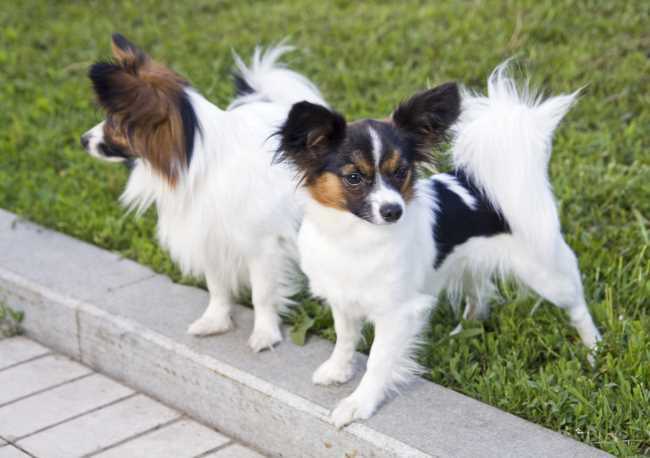 The Papillon has a single silky coat that is relatively easy to manage, although mats do form especially around the back and base of ears and the inner legs. If you find mats, you can remove them by gently working them apart with your fingers. Mats that are too tight should be cut in half lengthwise using curved shears with blunt tips and then gently pulled apart. Their long coat is deceiving because these dogs do shed and are not considered hypoallergenic. Shedding is year round and not considered seasonal so a regular brushing routine is encouraged. Regular brushing reduces the amount of hair showing up in the house. A good quality pin brush will keep away mats. A stainless steel comb with a fine and coarse teeth can be used to comb through the hair after brushing is done. The fine toothed comb can be used on the ears and tail and the coarse toothed comb over the body. Bathing is important and should be done whenever the dog is dirty, but at least every three weeks. The coat is brushed out prior to the bath, but it is usually advisable to spray the coat with a moisturizing or detangling spray before brushing. Brushing a dry coat will cause the hairs to break. This is true for the Pap as well as all long haired breeds. A few additional grooming tasks include clipping the nails, and trimming the pads of the feet. Neatly trimmed feet are much less likely to track in dirt, mud, leaves, etc. from the outdoors. Teeth should be brushed regularly. Papillons are considered to be a healthy, long-lived breed. 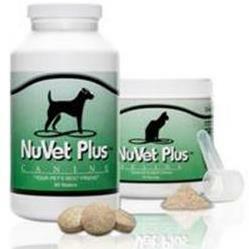 As with all dogs, they are prone to some hereditary diseases that seem to plague many small breed dogs. These include patellar luxation, open fontanels, dental deformities and Progressive Retinal Atrophy, and Epilepsy. Since the breed is still relatively rare, it’s not unusual to have difficulty finding the perfect one for you. Reputable breeders may be far from your location and most will only have limited litters available. Don’t settle for a pet store dog, however. Most pet store dogs come from large commercial breeding facilities many of which fall into the umbrella term, Puppy Mill. 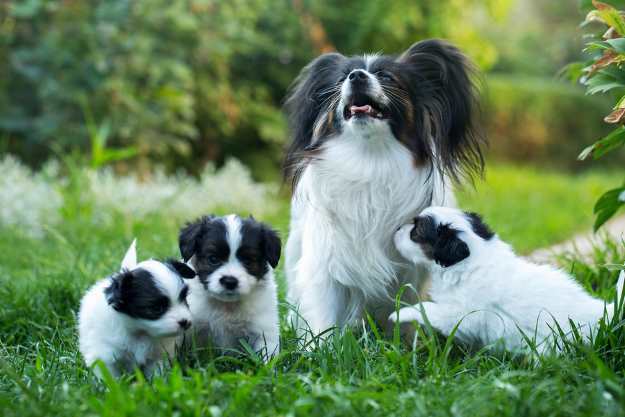 Since the Papillon is beginning to gain popularity, many puppy mills are beginning to breed them and dogs that are obtained from a pet store are at a distinct disadvantage as far as health, temperament and overall sociability is concerned. You may find one in a shelter or rescue if you are patient but again, this is rare so it is likely if you desire one of these dogs is to contact breeders. Be prepared to wait. Many breeders will not release the puppy until he/she is 12 weeks old and this is actually a good thing. Most Papillon puppies are not cheap, so expect to pay upwards of $1000 US Dollars for a good quality puppy.